Scrolling through social media you often come across fluffy dogs who you absolutely fall in love with. Not surprisingly, due to their teddy bear appearance, these typically white dog breeds are usually high on this list of love at first sight! But there is a lot more to a dog than their appearance. 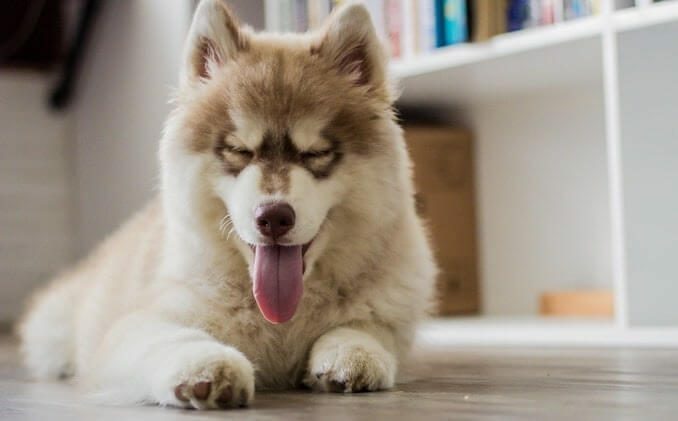 In this article we will summarize some of the best fluffy white dogs; their temperaments, their origin and what it takes to care for them. There are a range of things to consider before bringing a new dog into your home, we hope to help you on your journey. 7 White and Fluffy Dogs. 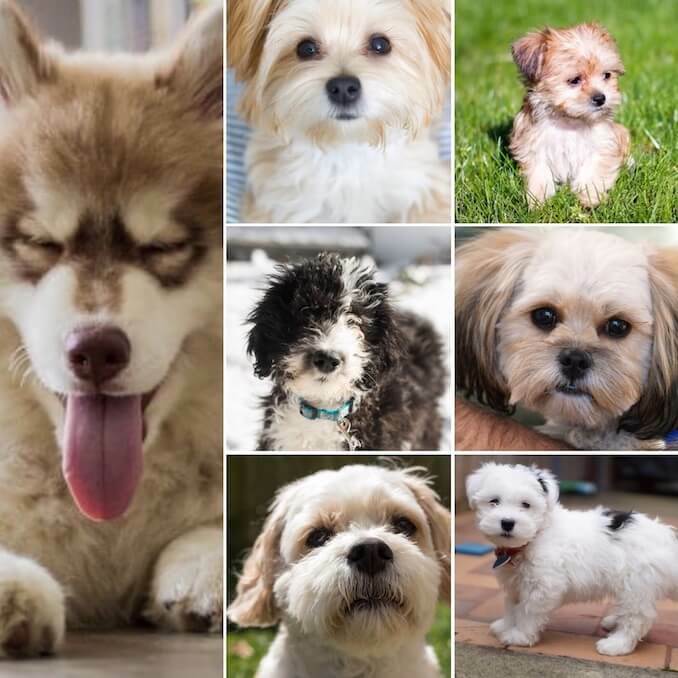 Starting top left (Corgi-Husky Mix, Morkie, Shorkie, Sheepadoodle, Peekapoo, Malshi and Cavachon). Classed as a toy breed, this charming ball of fluff is the perfect lap dog standing no more than 13” in height and weighing in no more than 20lbs in weight. Originating in 1996, this adorable cross between a Cavalier King Charles Spaniel and a Bichon Frise is gaining increasing popularity. Mostly white in color, thanks to their Bichon parent, this white dog breed is loved for its endearing brown eyes. Thanks to the Cavvy parent, most Cavachons present with a soft, wavy coat. The Cavachon has inherited the intelligence from its Bichon parent and charm from the Cavvy parent. When socialized from a young age, this mellow pooch mixes with humans and animals alike. Adaptable in nature, this intelligent companion is suited to most families and due to its small size copes well with apartment and city living. Low on exercise requirements, 30 minute walks will suit them fine. But, thanks to their high intelligence they are partial to some brain games and other mental stimulation. This also means they are a dream to train. The Cavachon responds well to positive reinforcement and reward based training. Brisk, interesting walks with a little time spent on training will ensure you have a content pup curling up on your lap at the end of the day. After all, that is the place the Cavachon is happiest. Looking for a mellow companion with an appearance to melt your heart? The Cavachon is a true contender. 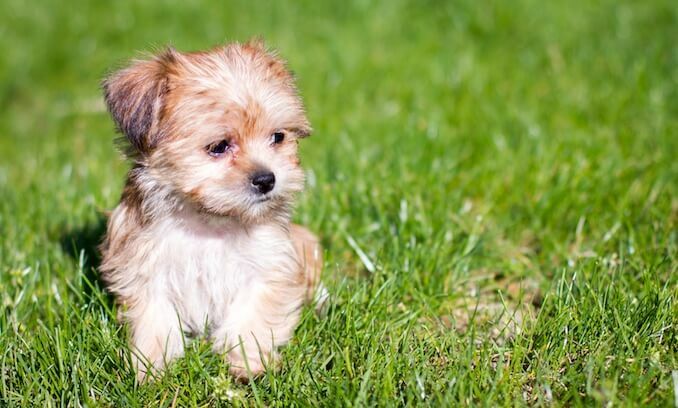 Often known as the Malshi, the Maltese Shih Tzu mix is a loveable fluffy designer cross breed. Another toy breed, the Malshi generally grows up to 12” in height and can weigh anywhere between 6-12lbs. Resembling a pom pom, the Malshi has a long fluffy, white coat. Although due to the high maintenance of grooming, most owners keep their Malshi clipped quite short. Malshis don’t realize they’re white; happily playing in muddy puddles whenever they get the opportunity. It is worth noting that as they are crossed with a Shih Tzu, the Malshi’s do come in a range of other less common colors such as black, brown or a bi or tri color mix of all. Originating in the early 1990’s these balls of fluff were primarily bred to be hypoallergenic. What we ended up with was a sociable, loving companion. The Malshi is suited to most families, tolerating children, adults and other pets alike. Coming in relatively low on the exercise front, a 30 minute walk will suit them fine. For this reason, Malshi’s suit apartment and city living equally as well as rural living. Despite the hope to out-breed certain health conditions, we know that the Malshi does suffer with some of the same issues as the parent Maltese and Shih Tzu such as Brachycephalic Respiratory Syndrome, White Shaker Syndrome and Patellar Luxation. This fluffy white dog is best suited to adult only homes, the intensely loyal Shih Tzu Yorkie Mix is a huge character in a small body. Standing no taller than 11” tall, weighing in between 5 and 12lbs, this feisty cross bred white dog is gaining more and more popularity. Most love the Shorkie for their soft and wavy hypoallergenic coat; although like most fluffy dogs their owners trim it short for lower maintenance. 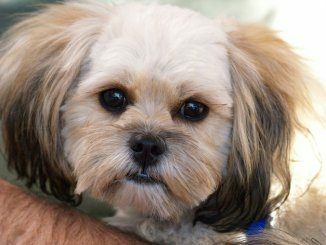 Thanks to the parent Shih Tzu and Yorkie, the Shorkie comes in a range of colors including black and tan, brown and white, black and white, gold and red. We’ve mentioned their adaptability to adult only homes; this is largely due to their feisty nature; being intolerant of unpredictable children and their well know stubborn streak. Shorkie’s aren’t the easiest of dogs to train, but positive reinforcement and reward based training gives you the best chance. Just like the Malshi, the Shorkies are known barkers – they are distrustful of strangers meaning they are perfect watchdogs who are fiercely loyal to their family. 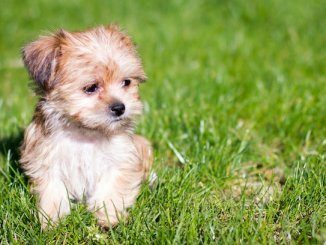 As with their parent breeds, the Shorkie is known to suffer with a range of health conditions including portosystemic shunt, patella luxation and common in small breeds, dental issues and bracycephalic airway syndrome. 4. Corgi-Husky Mix – The Cutest White Dog Breed Ever? Another fluffy dog, is the slightly larger Corgi Husky Mix. Weighing in around 20lbs and standing up to 13” in height, the Corgi-Husky has often been described as the cutest dog ever. The Corgi-Husky Mix is a result of mating a Corgi, either the Cardigan or Pembroke Corgi with the Siberian Husky. Inheriting the bossy intelligence from its Corgi parent and gentle yet strong will from its Husky parent, the Corgi-Husky is a mischievous mix of alertness and cheekiness. You’d think with their intelligence they would be a dream to train however, more often than not the Corgi-Husky Mix has their own agenda. A consistent routine with positive reinforcement gives you the best chance at training and socialization. Speaking of socialization, the Corgi-Husky Mix can tolerate other pets well if raised with them; but due to their stubborn nature they are better suited to adult only homes or homes with older children who have experience of larger than life characters. Their wolf like appearance is generally what most owners are attracted to; often described as a squatter husky who never grows up. Along with the husky appearance, they have retained the predisposition to separation anxiety – huskies are used to working in teams; you are a member of that team. They don’t tolerate being left alone and will often howl in your absence. Not an ideal way to keep on speaking terms with your neighbor! Early socialization and consistent training gives you the best shot at raising a well-rounded pooch; give the Corgi-Husky your time and patience and they will give you their loyalty and a character with which you will never have a dull moment. 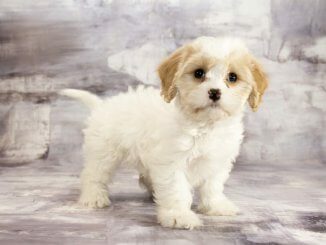 This fluffy dog resembles a teddy bear, the Peekapoo comes in a variety of colors including silver, grey, white, apricot, cream, black and chocolate. Being one of the longest standing designer white dog breeds, the Peekapoo is a result of mating a Pekingese with a toy or miniature poodle. Another one best suited to adult only homes, the Peekapoo has inherited its guarding behaviour from its Pekingese parent and its intelligence from the poodle parent. It is extremely wary of strangers, resulting in frequent barking. The Peekapoo can also be aloof with humans known to the family. If you are a part of the Peekapoos family, you will have a fiercely loyal companion who loves nothing more than to curl up on your lap. Only after you have been out for your daily walk though – Peekapoos are pretty high in energy, happy with around 60 minutes of exercise per day. They are certainly one to keep you on your toes. They have a medium to long coat if left to grow, but most owners have their Peekapoo regularly clipped to keep their soft, single coat lower maintenance. Their stubborn nature means training can be a challenge, especially housebreaking. Another feisty white dog breed is the Maltese Yorkshire Terrier Mix. Standing up to 10” in height and weighing in no more than 12lbs, this small pooch boasts the largest personality. Originating in the 1990’s, the Morkie has become a popular lap dog, loved for its affection and confidence. The Morkie loves nothing more than curling up on the sofa at the end of the day; probably because they are exhausted from all the barking they’ve done during that day. They are fond barkers – the mailman, next door returning home or even just because you’ve not given them quite as much attention as they’d hoped for. They are also sufferers of separation anxiety, so time spent alone should be kept to a minimum. Sociable and friendly, when introduced from a young age, the Morkie tends to get along with everyone, humans and animals alike. Intelligent but stubborn, training can be a challenge; keeping sessions short and positive will give you the best chance. 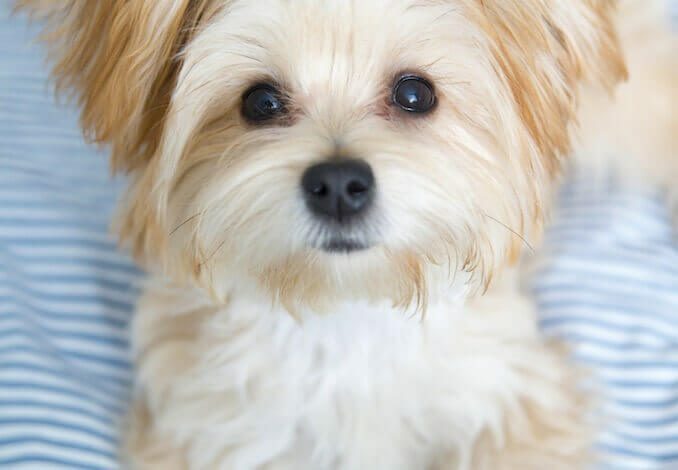 Despite the lengthy life span of up to 15 years, we know the Morkie can suffer some of the similar health concerns its parents do during this time, including: tracheal collapse, cataracts and glaucoma. They are frequent reverse sneezers. Last but not least, we end our list of fluffy dogs with the largest of them all. The Sheepadoodle, weighing in up to 75lbs and standing up to 22” in height, these giant fluff balls are energetic, trainable and super friendly. The perfect addition to any family, the Sheepadoodle is a result of crossing an Old English Sheepdog with a Standard Poodle. Combining the gentle nature of the OES with the energy of the Poodle, the Sheepadoodle is an even tempered, playful family member. Adored for their teddy bear appearance, Sheepadoodles come in pretty high on the grooming requirement. Regular brushing for this pooch is a must if you want to keep their coat flowing and matt free. Most owners clip their Sheepadoodle to help a little with their maintenance. Their popularity is in part to their hypoallergenic coat – but as we’ve mentioned before, no dog is truly hypoallergenic. Their coat still sheds, but due to the curls inherited from their poodle parent, the dander is trapped in the curls so less noticeable. Sheepadoodles are most common in black and white coloring, but it is also possible to find a pup in red and white or all solid colors too. 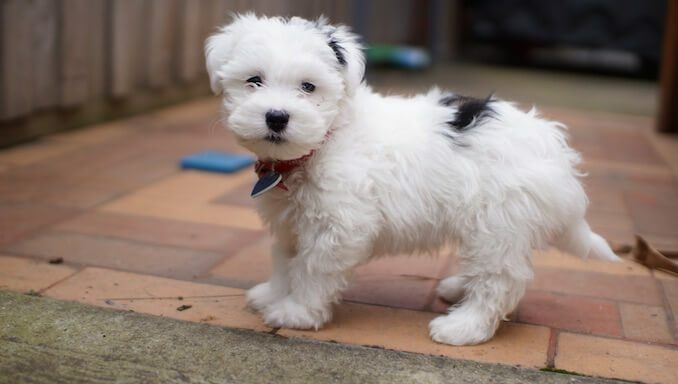 Inheriting their intelligence from the poodle parent and their gentle, easy going nature from the Old English Sheepdog, the Sheepadoodle is a dream to train. Everyone in the family can get involved; including the kids. In all honestly, kid involvement is a must as you’ll spend plenty of time walking and exercising these energetic guys. Which Fluffy Dogs Are the Best? So there we have it, 7 of the best fluffy dogs! 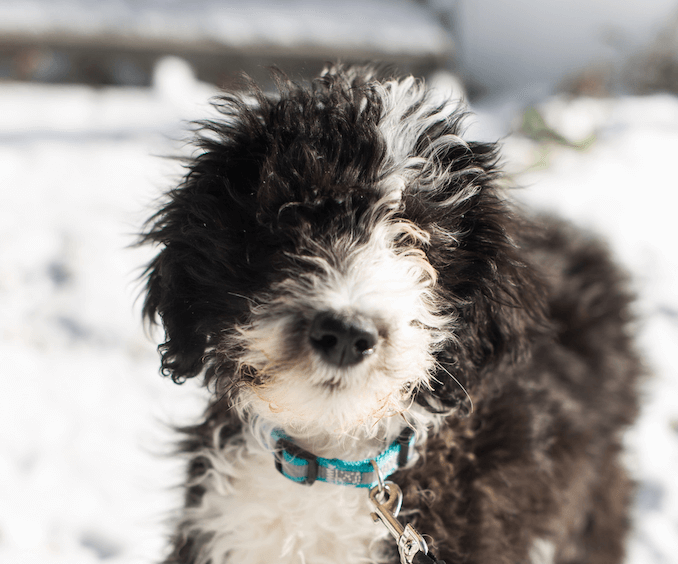 Ranging from the playful, even tempered larger sheepadoodle to the small but feisty Shorkie. Looking for a companion an an adult only home, the Shorkie or Peekapoo are perfect. The Corgi-Husky mix is also better suited to an adult home, unless the children are older and have experience of larger than life dogs. 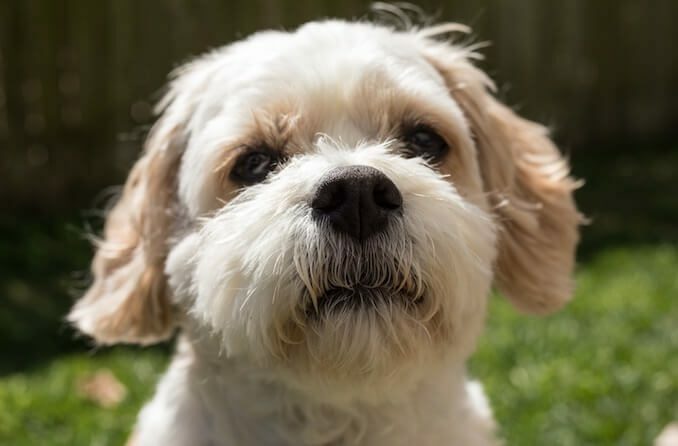 Considering an addition to a family, the Cavachon, Malteze Shih Tzu Mix, Morkie or Sheepadoodle are firm contenders. Most fluffy dogs are loved for their appearance, just figure out if their personality is something you are ready for too! Let us know what you think of these fluffy dogs below.